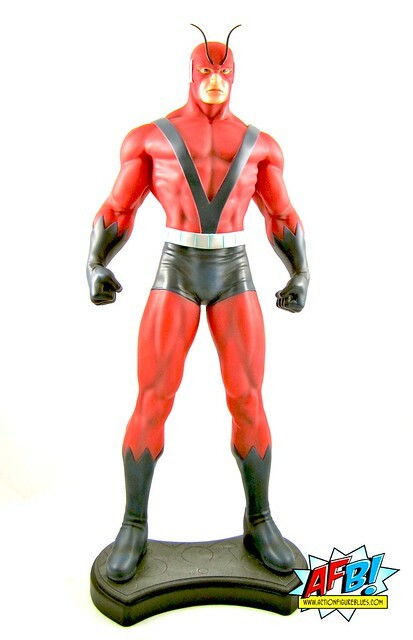 Bowen Designs Giant Man Statue - 21" of Classic Avengers Glory! 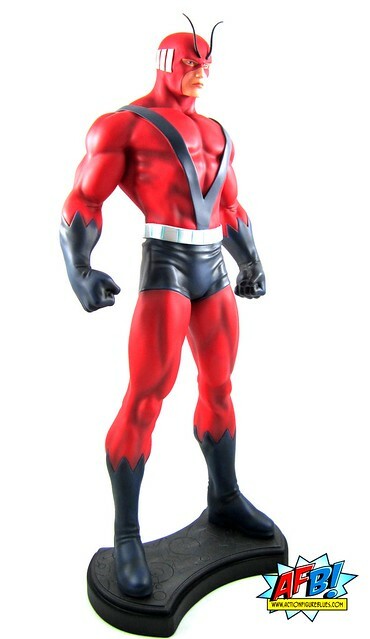 Bowen Designs has shown an extraordinary commitment to bringing every incarnation of Hank Pym to statue form. 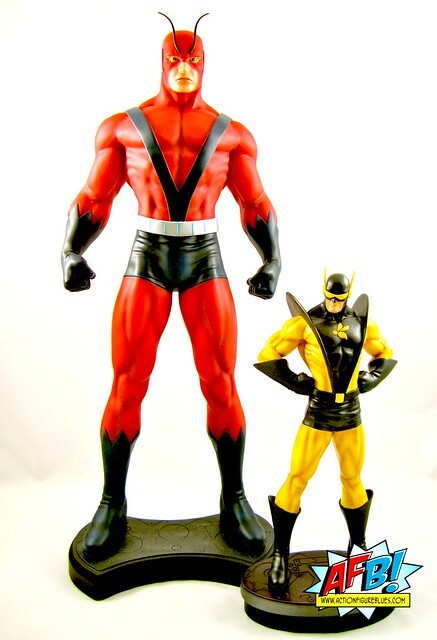 We’ve had Ant-Man and Yellowjacket, and will have two different versions of Goliath before the year is out. Towering over them all is the Bowen Designs Giant Man Statue, and its this mega-piece that I’m reviewing tonight. This piece was also featured as a Toy of the Week Discussion on Episode 4 of the Action Figure Blues Podcast if you’d like to have a listen. Coming in at 21 inches tall, this piece stands at the same height as a standard Sideshow Premium Format figure, which makes him a substantial piece and gives him ample height above his fellow Bowen Full Size Avengers to more than adequately depict his growth powers. This statue delivered a surprise to me as soon as I opened it, and that was that he is all one piece (base withstanding). I’m accustomed to statues of this size coming in pieces, and expected that some assembly would be required to make Giant Man truly giant, but that was not the case. The box isn’t particularly big by Sideshow standards, but it’s rather large for a Bowen box. Good fun. Bowen “Museum” statues, the style of statue that shows a plain, standing pose, often come under some criticism for their lack of action, but in general I don’t have issues with that - I like displaying my statues in groups / teams and so statues that take up less space are my preference. In this instance, though, I do think there may have been a bit of room for a pose with a bit more energy. This really is about as “bland vanilla pose” as you can get. I suspect, however, that the majority of those that have purchased this significant piece will be planning to do what I am, which is to put him in the centre of a classic Avengers display. For that purpose the pose is pretty much exactly what’s needed – and perhaps that was the idea all along. Pose aside, the sculpt work here is excellent – the headsculpt in particular ticks all the classic Giant Man boxes. 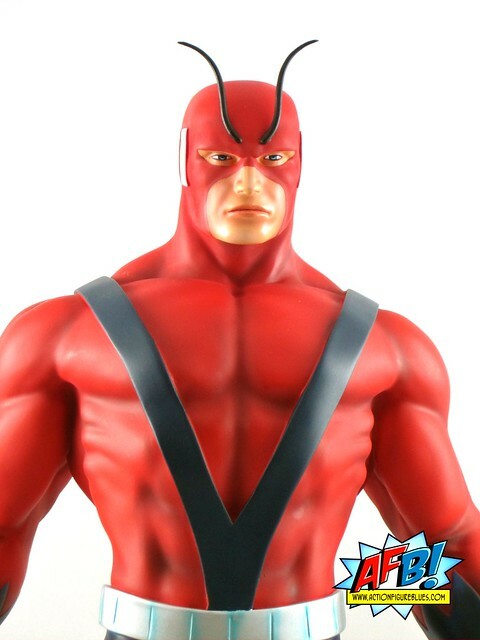 All costume lines and breaks are sculpted, and there are nice details like the natural folds in his trunks and the raised layer of his harness – which isn’t his first appearance get-up, but the later “V” style. He has a nice set of antennae, which are made from a slightly pliable material to save snapping off from a bump. I’d be interested to know how these are applied, as they seem very securely fixed to the head but there is no sign of any glue or other means of affixing them. The base for this statue is a standard Bowen base with the circuitry type pattern that features on many of the Avengers statues. I appreciate the simplicity and the small circumference of the base as it minimises the space (width wise at least) that this statue needs and makes it possible to make him the centrepiece of an Avengers display. Speaking of that display, the only genuine issue I have with this great statue is where I’m going to place him. He’s too tall to fit on any of the shelves I normally use for my Bowen pieces, so I have him up on top of my display cases with my Sideshow pieces, where he fits in scale but not theme. Working him into a classic Avengers display is not impossible, but it’s going to take some doing, however it is most definitely a project work doing. Bowen really does need to be commended for tackling challenges like this, especially for such small production runs. A Classic Wasp is on the way that will allow us to fully assemble the original team in statue form very soon! I like this one. Simple, strait forward and just solid. The most important 3 S's for me. I dunno. I thought the face was a bit odd. Quite wide and squinty.